The most common and widely-used embroidery stitches are the stem and the outline. Both are used primarily for stems and outlining and they are very similar in how they are worked. For stem stitch the thread is always kept below the needle; for outline it’s always kept above. They look pretty similar when completed, too. To work the stem stitch bring the thread to the front at the left edge of your drawn line. With the thread below your needle, take the needle to the back about ¼ inch to the right and re-emerge at the point where your thread began. Pull the thread through. Repeat and continue along the line, keeping the tension even and the stitches the same length. Stitches that are close together make a tight line, ones that are farther away make a looser line. When you come to the end of the line, take the thread to the back for the last stitch but don’t re-emerge. Secure the thread with tiny back stitches or weave it back through the line before clipping any excess thread. On both of these stitches you’ll see an even row of backstitch on the wrong side of the material. 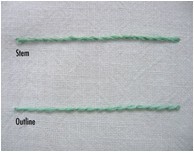 For the outline stitch, do the same thing but keep the thread above the needle.